You’ve probably seen it pop up in your Facebook feed. Or maybe someone on Twitter linked to their account. 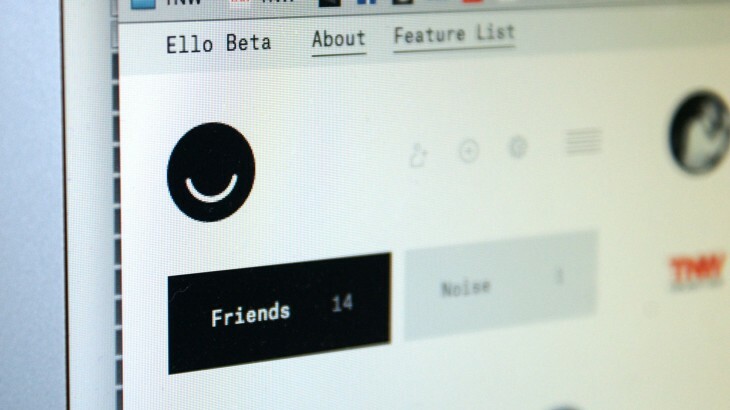 The entire internet is alive with talk of Ello, the anti-Facebook social network. An anti-Facebook sounds pretty cool right? But what exactly does that mean? And is it worth your time and effort to start using yet another social network. Remember when we all thought Path was going to be the next big thing? Let me break it down for you. “Ello is a simple, beautiful, and ad-free social network created by a small group of artists and designers,” is how the creators from graphic design studio Berger & Föhr describe the network. It sounds like a hippy commune on the internet, but when you’re tired of the non-stop ads and weird algorithm of Facebook, an ad-free digital zone run by artists seems pretty fantastic. The company also states that it won’t sell data about you to third parties and calls the collecting and selling of your data, “creepy.” Of course Twitter, Facebook, Tumblr and other social networks and services started out ad-free too and now those services are turning into information superhighway populated by billboards. Ello acknowledges this and says that if they ever do change their no-ads policy they would lose most the community (maybe, we’re all still on Facebook) and notes that it if does pivot in a direction you don’t like, there’s a Delete Account on every user’s page. Ello is free to use and it intends to stay that way. That’s great, but you can’t hire developers and scale user load with manifestos, art history degrees and dreams. So the team says it will be offering “special features” in the future that users can pay for. So it’s more of a freemium model. It’s worked for mobile games so maybe it’ll work for a social network. So What Can I Do With Ello? Like every other social network you can post status updates and photos. Unlike Facebook, it supports GIFs. You can also comment on posts and reply directly to your friends and you can also see how many people have viewed a post and edit a post if you missed a typo before pushing it live. There’s also a Noise section that showcases posts by people you might not know arranged in a loose grid. It’s like an online art show at the neighborhood gallery. Frankly, there’s nothing on Ello that hasn’t been done before. 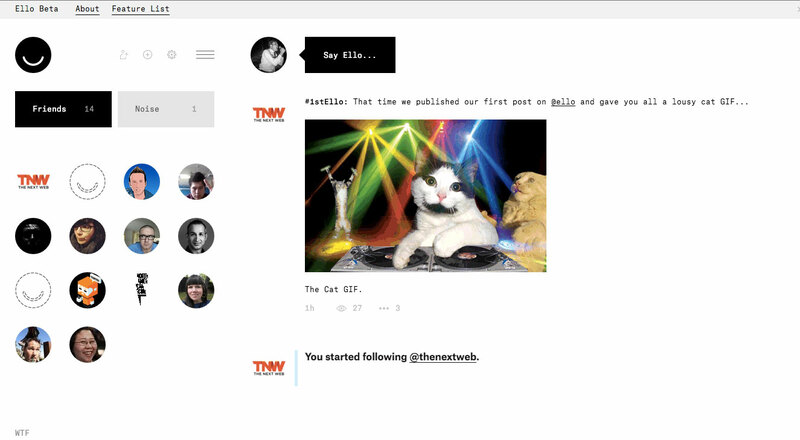 In fact, its biggest feature is a social network fresh start and its stripped down timeline. The biggest drawback is that it’s in beta and you can feel it. Even signing up and sending out invitations at 11pm PT was a buggy chore. The user search field only works about 30 percent of the time and there is no discovery feature. I found most of my friends because they linked to their account on Twitter. Right now using Ello is like using early-days Twitter. Well the team has a pretty substantial list of new features its working on including support for inline video and audio posts from YouTube, Vimeo, Vine, Instagram and Soundcloud. It’s also working on user blocking which is sadly something every social network needs now. It’s also getting inappropriate content flagging, private accounts, reposts with author attribution, a notification center, iOS and Android apps and private messaging. So Who Should Sign Up For This? If you’re comfortable with all the bells and whistles of Facebook, Google+ and Twitter and you’re fine with your information being mined for ads, Ello isn’t for you. Also, if you want your social network to actually work at least 90 percent of the time, you might want to steer clear for a few months. But, if you’re looking for an alternative social network without ads (or you’re concerned about getting your username before anyone else) and you can handle a few rough edges, Ello is off to a good start. To join Ello you need to be invited by an Ello member. Unfortunately, all the hype about the service has caused the developers to put a halt to invitations. This is a temporary issue, but it showcases the fact that it’s brand new and still in beta. As for longevity, that’s really up to users. App Dot Net, Path, Google+ and others have tried to cut into Facebook’s dominance of the social networking space. None have done much to stop the juggernaut of Likes. Ello probably won’t make much of a dent either. But it could be a nice quiet place to share your thoughts and artsy photos.